On our trip to the Andaman and Nicobar Islands, we worked with the Andaman Nicobar Environment Team (ANET) for a couple days. There, we learned about the intertidal ecosystem that the Andamans supports through its mangrove forests and got to see for ourselves the different animals that come out at different times, high tide and low tide. We also learned about a fishing village and the effect that overfishing due to international consumer demand has on local fish populations. 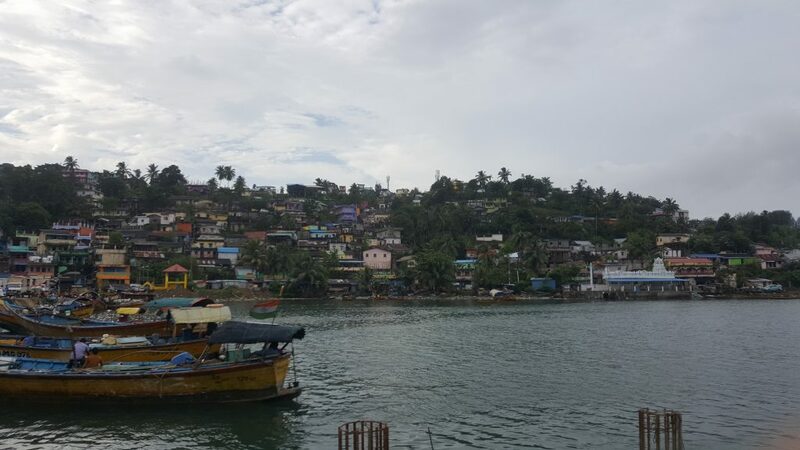 At the fishing village, we talked about what different methods people use to fish and the fact that scientists working in the Andaman Nicobar Islands are lacking the data needed to determine if it is actually sustainable or not. We went on two walks through the mangroves, once during high tide and a couple times during low tide. The tides coincide with the movement of the sun and the moon so high tide is at night, when the moon pulls the ocean’s currents towards it and low tide is some time during the day, when both the sun and the moon are exerting a gravitational pull towards the ocean’s currents at different angles. We walked straight from the ANET camp to the mangroves within a couple of minutes. It was a really interesting walk because we were barefoot for most of the time as we waded through mud and small pools of water. Everyone was a bit apprehensive at first, mostly because there were so many animals dotting the floor (and, personally, because I don’t go barefoot often much less barefoot in the mud). After a while though, it was fun to walk through and see so many different animals just living their lives. We saw fiddler crabs, mudskippers, snails, sea slugs and a variety of other crabs. As we walked along the mangroves, we learned about the different types of roots that the mangroves use to serve different necessary functions as well as the importance of the mangroves and their root systems as a habitat for smaller animals. We learned about three different types of root systems: pencil roots, knee roots, and prop roots. Pencil roots help the plant gather oxygen in a low oxygen environment like the muddy area in which mangroves live. These types of roots grow in wide horizontal arrays around the tree and occasionally stick roots vertically out of the ground, providing both a bit of stability and exposed tree surface area that can capture oxygen. Knee roots occur in different species of mangrove trees and serve a similar purpose as pencil roots, for oxygen and stability. Finally, prop roots are roots that grow from the sides of the main tree trunk and establish themselves in the ground around the tree. They are meant to be support and also are usually outside of the water most times which allows more oxygen to be available to the tree for longer periods of time. Mangroves serve as excellent nurseries for small fish and other animals that come in with the high tide waters because of the habitat that their various root systems provide. In fact, we saw small shrimp, fish and other crabs swimming around our legs during the night mangrove walk. Along with those small animals, we saw a couple of snakes and even some eels, which were most likely preying on the smaller animals. 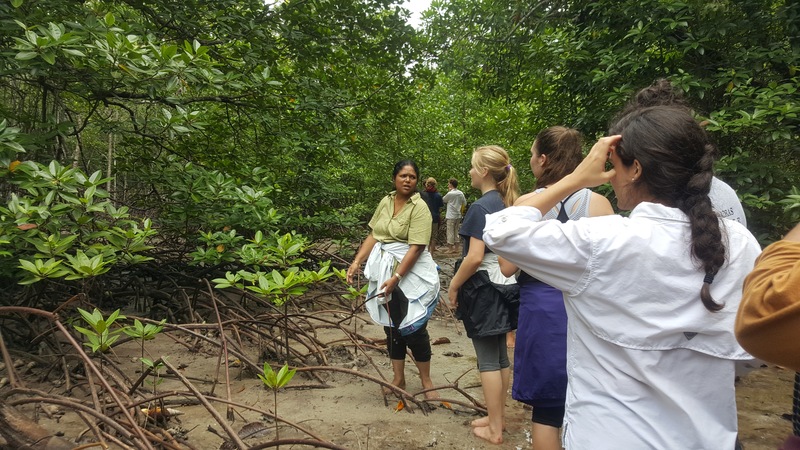 In other words, we were able to catch a glimpse of some of the ecosystem interactions that occur in the mangroves every day. 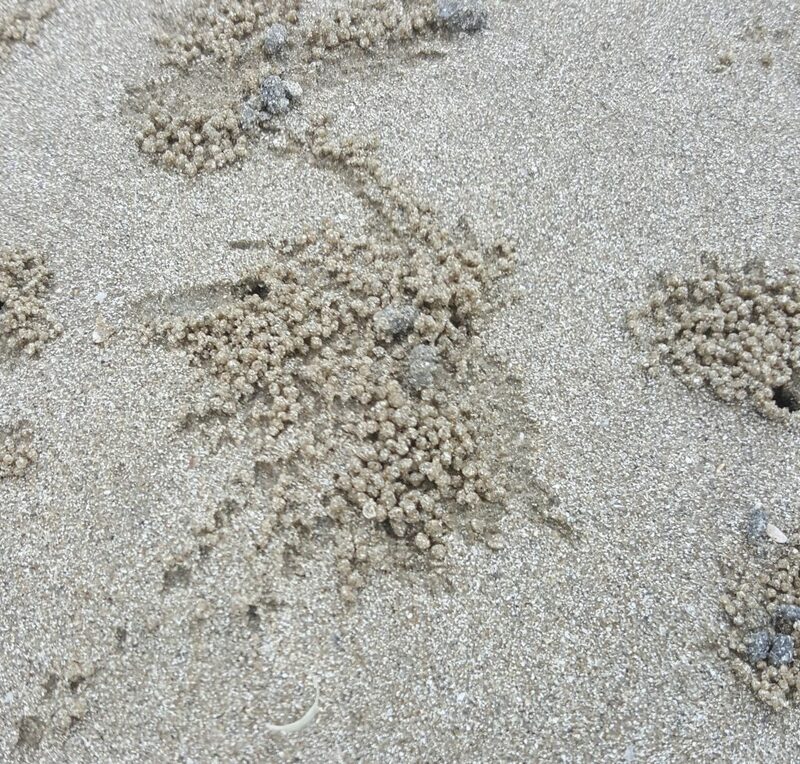 We also took a walk along the coast of the main island and saw many small pellets of sand perfectly shaped into balls around an opening where, if you stayed still long enough, you could see small crabs coming out and filtering the sand through their bodies to get nutrients from the sand, leaving behind small, perfectly round balls of sand. 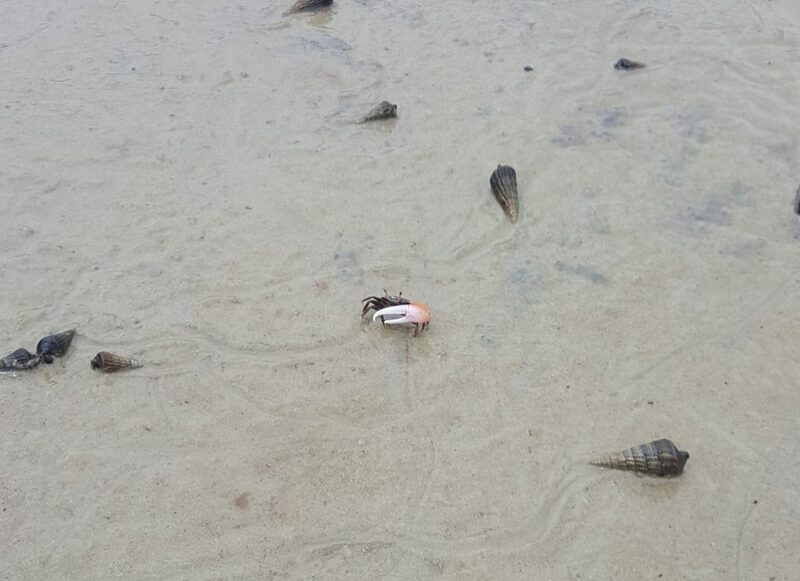 I later found out that these crabs are called sand bubbler crabs, quite a fitting name. The pellets of sand were scattered around the crab burrow as the crab continues to feed on the organic material within the sand forming really cool designs. The eating habits of these crabs fascinated me, and I’m not alone. 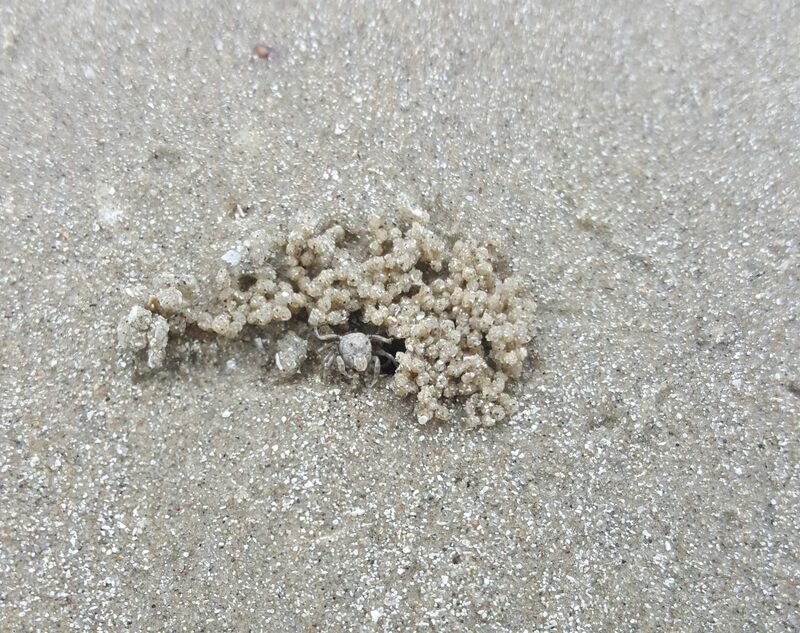 I was even able to get pretty decent pictures of the crab creating its little ball of sand, which was one of the small highlights from the trip. Our trip to the fishing jetty early in the morning was also really cool. There, we saw the fishermen bringing back their catch and giving it to the many women (who I assumed to be their wives or family members) who would then hoist large pots full of the fish onto the tops of their heads and walk quite a trek up to the fish market where they sold the fish fresh. We were informed that most of the catch the Andaman and Nicobar Islands produce are actually sold in the world market, mainly to Japan, China and the U.S. But a small percentage is still consumed within the islands (we were actually treated to some freshly cooked and delicious tasting fish bought from the fish market for dinner that night). It was interesting to know how much the world market affected such a relatively small village of fisherfolk and how interconnected their livelihood was not only with the fish and ocean species that they capture but also with human beings many miles away living an entirely different lifestyle. At the fishing jetty, we also learned about the impact that different methods of fishing had on fish ecosystems. There were two main types that we learned about, Trawling and line fishing. Trawling was much more negatively impactful, especially to the coral ecosystems on which the fishermen of the Andaman and Nicobar Islands rely heavily. This is because Trawling is a technique that indiscriminately captures tons of fish all at once. The communities of fish in and around the Andaman and Nicobar Islands that these fishermen catch consist of many different species, not only one species of fish which causes there to be a lot of “bycatch,” basically anything that the fishermen did not intend to catch or cannot keep. Often, this bycatch will die as the fishermen do not have the time or the resources to weed out the bycatch from the haul and set them back into the waters alive. Thus, many protected species or species that are endangered may be lost and their loss will not be recorded or noticed. Long line fishing is less environmentally impactful compared to trawling, however bycatch of endangered or juvenile species still exists. The consumer market for the types of species that come out of the Andaman Nicobar Islands is another part of the reason that endangered and juvenile species and thus the entire ecosystem of the coral reefs off of the Andaman and Nicobar Islands are negatively impacted. There is one particular species of fish, what the locals call the “dollar fish” that fetches a high price and thus is sought after by the fishermen themselves. This species of fish catches a higher price specifically at a younger stage of development, when they are large enough to take up the size of a dinner plate, and so there are huge ecological impacts on the population dynamics of the species. If you catch and take out only the younger generations, before they are able to reach reproductive maturity, you are essentially taking out the future generations, causing the production of young to drop as there aren’t the same amount of newly reproductive individuals coming into the system. Essentially, there is no regeneration of reproductive individuals as the older reproductive individuals die off or are no longer able to reproduce. Overall, the trip to the Andaman and Nicobar Islands was simultaneously exhausting, relaxing, frustrating and interesting. It was exhausting because our bout with ANET was packed full every day with information and learning experiences and we also kept ourselves really busy after the few days we spent with ANET by island hopping and learning about and experiencing the different islands. It was also relaxing in a way because we were, after all, on an island that was quite beautiful with little responsibilities on our mind due to the lack of accessible WiFi. It was frustrating because the lack of WiFi caused a buildup of work as well as worrying about how family and friends are back home, on top of the fact that what we learned about has no simple fix to what we know is happening in our oceans. There is not an easy fix not only because of time and data constraints but also because of social factors like determining what role scientists have in contacting and involving themselves with the fishermen community and with the government that enforces protected species laws. And finally, It was interesting because of how much we learned with ANET in so few days, packed with hands-on, experiential learning that I had previously only learned about in books or in lectures. The experience I had at those islands though, is sure to stay with me for years to come and I’m deeply appreciative of the fact that I had the opportunity to go to such an awesome place.